Most long gloves that protect against both mechanical injuries and hazardous chemicals offer very little in terms of dexterity. The Uvex Rubiflex S NB35B 35cm Chemical-Resistant Gloves are flexible in design, so that you're able to perform all the intricate tasks you're used to. This makes them ideal for industries where chemical resistance, good grip in oily environments and outstanding dexterity go hand in hand, such as mechanics' work. 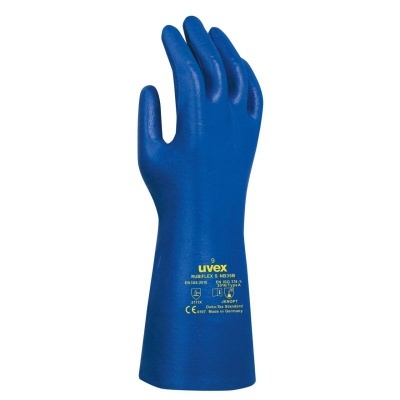 The Uvex Rubiflex S NB35B Gloves are available in four sizes that should suit the hands of most users. Please measure the circumference of your hand around the knuckles (excluding the thumb) with your hand open and your fingers together, and the length of your hand from the tip of your middle finger to your wrist.